‘Mistaken for Strangers,’ a new documentary about the National on tour, will premiere on April 17 at the opening night of the 12th annual Tribeca Film Festival in New York City. The film was directed by frontman Matt Berninger’s brother, Tom, and after the screening, the band will take the stage for a special performance. A self-described heavy metal and horror movie enthusiast, Tom moonlighted as a roadie-turned-auteur during the trek, and ‘Mistaken for Strangers’ focuses on the relationship between the two siblings, the fraught job of a roadie and life on road with a touring rock band. 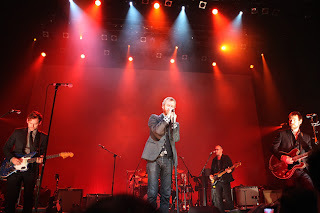 The National have provided music for such movies as Tom McCarthy’s ‘Win Win’ and TV shows as ‘Game of Thrones,’ but ’Mistaken for Strangers’ — whose title is taken from a song off their 2007 album ‘The Boxer’ — is the first feature-length film to focus on the band. The filmmakers are still looking for a distribution deal, and while we’re looking forward to a large-scale release, we’re not really looking forward to those shower scenes.